HOWYWOOD KINDERGARTEN! : FAVORITE Word Work Activity... Our FREE GIFT to YOU! 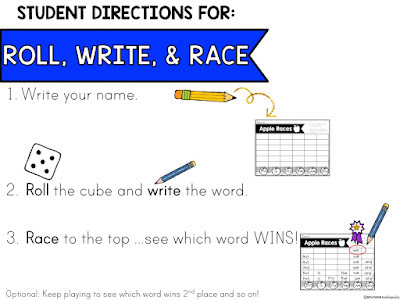 FAVORITE Word Work Activity... Our FREE GIFT to YOU! BIG NEWS! Exciting times around here at Howywood Kindergarten! 1. We're launching our very own online shop at www.howywoodkindergarten.com and we'd love to have you check it out (just click the word "shop" at the top of any page here)! You and your students are going to LOVE this. It stands the test of time, works with any kind of class... with any words... all year long! And we just gave it a huge make-over so now it's 28 extra FUN and FESTIVE pages for every season of the school year! Yessssss! Your kids will literally go crazy for this activity (in a good way... but warning: there miiight be some cheering and excitement, see video below) ... and most importantly, the emotional connection this game creates makes it a highly effective way for your kids to get familiar with their words (sight words, spelling words, etc- you can really use it for anything you want)! Each page teaches 6 words and each word corresponds with a # on a die. Kids roll the die and write the word in the blank above the corresponding number (be sure to have them actually WRITE the word and not just color in spaces like they’re graphing). It quickly becomes an exciting race to see which word will WIN by making it to the top first! I like to play this whole group (kids will literally be cheering for the word they want- it gets intense... in a good way that makes the words so memorable to them!) and I also like to use this as an independent word work activity for our literacy center time. This resource includes 28 fun seasonal variations of the game that make it SIMPLE for you to keep things looking fresh and super motivating for kids ALL YEAR LONG. 1. Zero Prep: You can train kids to select their own 6 words to use and write them in at the bottom of the sheet. You can coach them to choose challenging words, anything from their spelling list or the class word wall, or give them a list to choose from. Print-and-go sheets for this are included as part of this PDF. 2. One Minute Prep: This one is EDITABLE on Google Slides (your easy link is included in the freebie) so you can type in the exact 6 words you want kids to use and print. I like to look at assessment data and choose the top 6 trickiest words for my class. Then ...just print and go! So there you go! 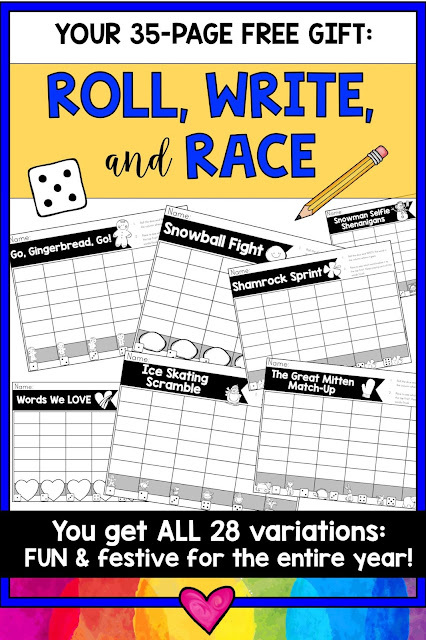 Sign up (on the sidebar to your right) and you’ll get a link to your very own editable copy of Roll, Write, & Race right away (HEADS UP: it miiight land in your “promotions” folder. If you drag the message to your "primary" inbox, we’ll show up there from now on and you won't miss anything). We hope this first freebie (of many we hope to share with you!) will be a huge hit in your classroom!